In this Monday, Jan. 14, 2019 aerial image taken from a drone video and provided by the City of Westbrook, Maine, a naturally occurring ice disk forms on the Presumpscot River in Westbrook, Maine. 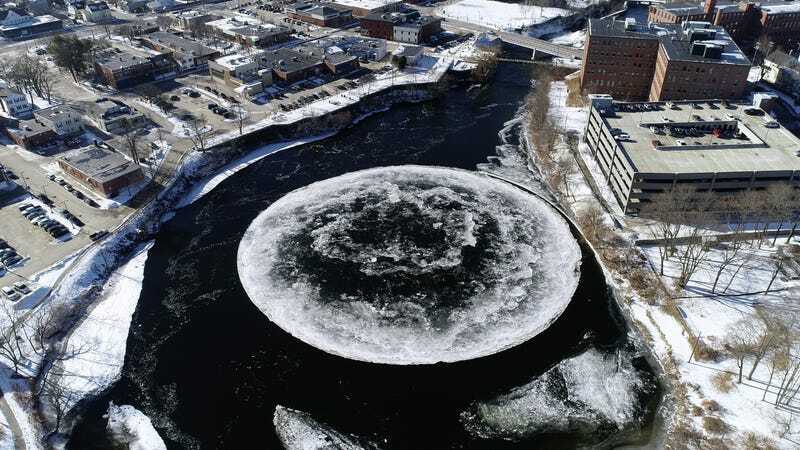 You may have recently read about that colossal spinning ice disk that recently turned up in Maine—the one that appeared larger than a neighboring multi-level parking structure? It stopped spinning. But reader, some ambitious soul has set it free again. After it was reported midweek that the roughly 300-foot-wide ice structure that’s currently chilling in the Presumpscot River in the Westbrook suburb of Portland had become stuck and unmoving, reports suggested that it may not be long for this world. But reached by email on Saturday, Westbrook marketing and communications manager Tina Radel told Gizmodo that “a paddleboarder broke it free and it was sucked back into the eddy.” It is back to spinning and attracting crowds, she said. The Portland Press Herald reported Thursday that an individual identified as Andrew Sims, a photographer, used an icepick and paddleboard to break free the enormous ice structure. After taking his paddleboard to the river, the Press Herald said, “he kneeled on it while he began cutting around the edge using an ice pick and his own weight to break the ice where it was attached to the bank.” People reportedly started clapping when the thing was released. Other research from a team with the University of Liege in Belgium suggests that water temperature variances under the disk, resulting in a vortex, may have something to do with some of its spin, according to the Press Herald. Gutmann noted that while these ice disks are uncommon in cities, he “suspect[s] these occur more often than we think.” However, as the New York Times reported, they don’t normally reach the epic proportions of this hulking ice circle. California Institute of Technology professor of physics Kenneth Libbrecht told the Times the disk’s size was potentially nearing record-breaking territory. My favorite anecdote about this particular disk comes courtesy the Associated Press, which noted: “Social media users compared it to an alien spacecraft and the moon, and ducks used it as a big raft.” Possible contact from extraterrestrial lifeforms! A sizeable floating device for waterfowl! This large boi has something for absolutely everyone. This is not the only disk making headlines this week, however. The Associated Press separately reported Friday that yet another ice disk discovered by a park ranger has surfaced in at Baxter State Park in northern Maine, though that one is markedly smaller at roughly 30 to 40 feet across. The comparably miniature one, it’s worth noting, was not reported to be spinning ominously.